Spiraea are a genus of deciduous flowering shrubs in the rose family. The total number of spiraea species is estimated to be about 80 to 100, but spiraea japonica or Japanese spiraea is the most wildly cultivated species for hedging. Spiraea are small to medium shrubs loved for their abundant cascades of flowers, availible in a wide variety of colours, which make them a good choice for mixed borders as either a freestanding shrub or as a low hedge, reaching an ultimate height of 1 metre. Spiraea have slender branches, which are home to green lobed, toothed or smooth leaves, depending on the variety you choose to plant. Spiraea species make perfect boundary hedges, but are not suited for screening or privacy, as their growth habit is not dense and tall enough. The main attraction of spiraea varieties is their flowers. Depending on the variety chosen, these profuse flowers can be enjoyed between spring and late summer. But even after these blooms have disappeared, the foliage of spiraea species will acquire a rich autumn colour before being shed. The blossoms are not only attractive to humans; a wide range of insects will love to visit your garden if you choose to plant a spiraea hedge in it. Through the years, a wide range of cultivars has been developed, many of them belonging to the japonica species. This includes common cultivars like the ‘Anthony Waterer’, the ‘Genpei’ and the ‘Goldflame’, offering a variety of flowering colours. Some of these cultivars even offer a different colour foliage. The Japanese spiraea is of course native to Japan, although the greatest number of varieties exists in southwest China. Other native spiraea species can be found in virtually all temperate regions of the Northern Hemisphere. 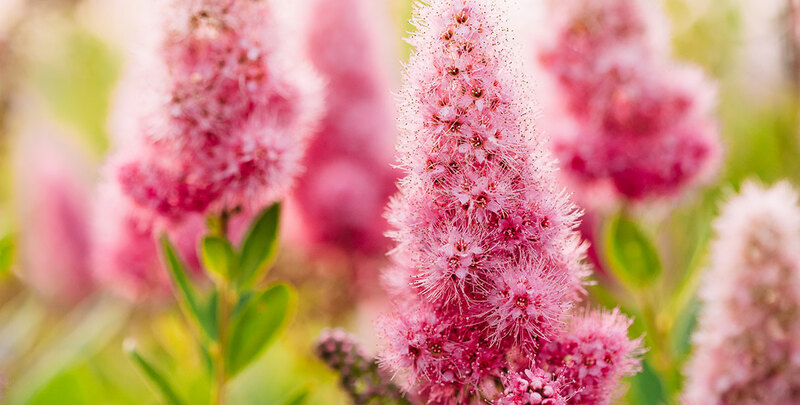 Native Americans discovered the medicinal use of spiraea species a long time ago, using the plants as an ingredient for enemas or as a remedy to treat venereal disease and abdominal pains. Because of their dense clusters of showy flowers, it was only a matter of time before spiraea species would be appreciated for their aesthetic value. The rise of spiraea as an ornamental plant in North America started around the end of the nineteenth century, with the taller species becoming popular as hedging plants, while the low-growing species will make an excellent groundcover. 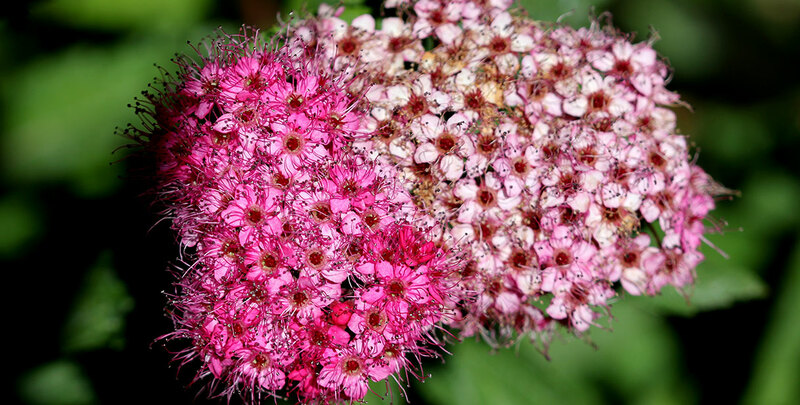 Apart from making any garden look a little livelier with its brightly coloured flowers and elegant leaves, spiraea species can also support endangered pollinators, as their flowers are an important source of nectar for bees, butterflies, bumblebees and other useful insects. Landscapers also like to plant spiraea species in public parks and urban gardens. This is not very surprising, as spiraea cultivars are generally very easy to grow and maintain and therefore lend themselves perfectly for use in public spaces. In fact, most spiraeas are extremely hardy, with some species even being able to cope with up to minus 35 degrees of frost. So even in areas where winters are moderately harsh, landscapers and gardeners do not have to worry about whether or not their spiraea will survive the cold season. This highly versatile hedging plant will thrive in most British gardens, provided that the soil is not too heavy. Anything from sand to loam or chalk is fine, while acidic soils will generally not cause any issues and it can even be planted in difficult urban soils. However, spiraea hedges are ideally planted in fertile, moist, but well-drained soils. Waterlogged (clay) soils are not suitable. 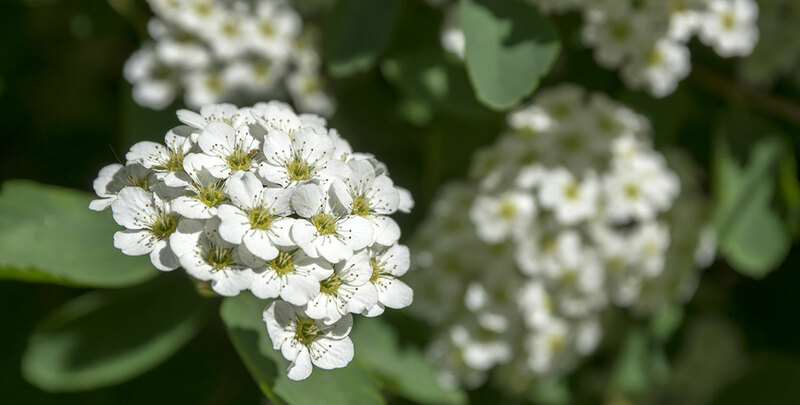 A site in the full sun will be best for flowering and while partial shade is tolerated, your spiraea hedge will produce fewer flowers and have a more open growth habit when it is planted in such a position. Full shade, however, should be avoided, as a lack of sunlight will result in stunted growth and a significantly reduced flower production. Pruning requirements depend on the variety chosen. Some should be pruned at the beginning of the growing season, which is in the early spring, directly after the winter. Other types, however, are best trimmed straight after flowering. The best pruning techniques also differ from variety to variety, so therefore, it is best to look up pruning instructions for each individual variety. Selecting the type of spiraea hedge that suits your wishes requires a little effort and attention, but will ultimately be worth your while. Generally, spiraea hedges are very easy to grow and maintain, though it is worth noting that they should be watered regularly during the first two years after planting. Watering them at least once every two weeks is recommended. Most spiraea species have an annual growth rate of 10 to 15 centimetres, but the very common hybrid spiraea x cinerea ‘Grefsheim' is a little different. First of all, they are the only variety described on our website that does not belong to the Japanese spiraea species. 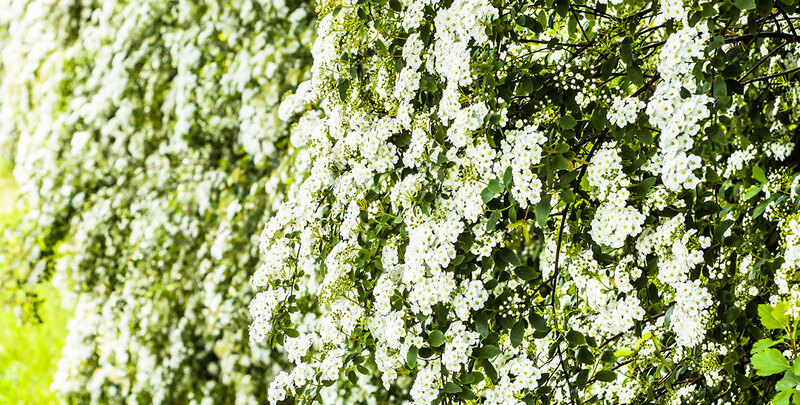 As such, it produces profuse white blooms and grows no less than 30 to 50 centimetres per year, resulting in a taller hedge, which can reach up to 1.50 metres in height. Like any other spiraea hedge, however, it will form a beautiful boundary around your garden. Its dense flower clusters and elegant leaves, as well as its beautiful autumn colouring will certainly make your garden stand out. You could also choose to combine different spiraea species with different flowering periods to prolong flowering season and have a colourful hedge for the longest possible period.